Brad Butkovich is known in Civil War wagaming circles for a series of excellent scenario books for regimental-level gaming, with a strong focus on action in the Western Theater. His research skills and attention to detail are evident in those scenario books, as is his grasp of the military tactics and objectives of the commanders. Based in Lilburn, Georgia, Brad has maintained a keen interest in Civil War events in his region, including the May 1864 Battle of Pickett’s Mill. The old battlefield has remained free from major development, and in recent years has been preserved and nicely interpreted, sparking renewed interest in this early fight between William T. Sherman’s Union forces and the Confederates of Joseph E. Johnston. More than 2,000 men died in what became one of Sherman’s rare severe defeats, one which he conveniently neglected to mention in his post-war memoirs. It was a stinging loss, one which largely has also been overlooked in most histories of the fighting in North Georgia other than a passing mention. This 207-page book is divided into 17 short chapters which set up the battle in its military context, examine the leaders and major personalities, recount the movements of the opposing forces to come to the encounter, and then present the battle situation and unfolding combat action. Butkovich then dives into the aftermath of the fighting and what the next steps were for Sherman, Johnston, and their key subordinates. He then finishes with an interesting account of the postwar history of the main properties where the fighting occurred and the efforts to preserve the old battlefield as a memorial park so that future generations may ponder what happened there. Among the many useful features of the book are the excellent maps, which are plentiful and well crafted. Drawing from his previous experience in creating his own maps for his wargaming efforts, Brad has included more than a dozen useful maps of various phases of the Battle of Pickett’s Mill. All are well done and serve the dual purpose of helping illustrate the ebb and flow of battle and to serve as an inspiration for tabletop wargaming the various phases of the battle. All in all, this is an excellent addition to the historiography of the warfare in North Georgia and William T. Sherman’s movements toward Atlanta in the spring of 1863. 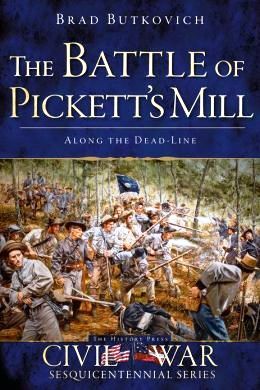 Brad Butkovich’s The Battle of Pickett’s Mill: Along the Dead-Line is a product of The History Press and is part of their popular Civil War Sesquicentennial Series. The annotated,indexed book retails for $21.99 but can often be found at a lower price deeply discounted on amazon.com. It’s well worth the investment and should be a “must have” for anyone interested in the Atlanta and North Georgia military operations.